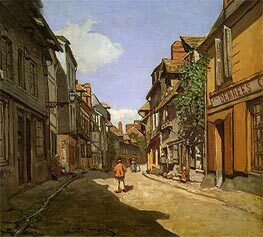 He first became known locally for his charcoal caricatures, which he would sell for ten to twenty francs. 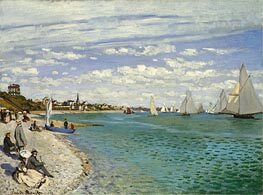 On the beaches of Normandy, he met fellow artist Eugene Boudin, who became his mentor and taught him to use oil paints. 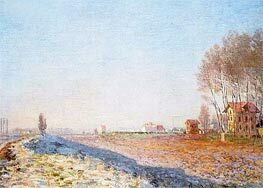 Boudin taught Monet en plein air (outdoor) techniques for painting. 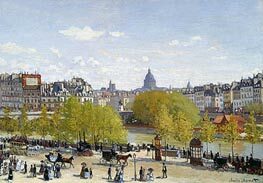 When Monet travelled to Paris to visit The Louvre, he would see many painters imitating famous artists' work. 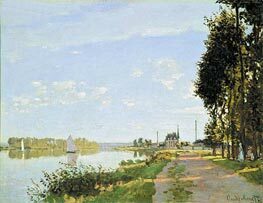 Monet, having brought his paints and other tools with him, would instead go and sit by a window and paint what he saw. 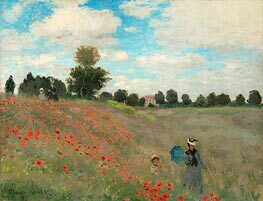 Monet served in the army in Algeria for two years of a seven-year commitment (1860–1862), but upon his contracting typhoid his aunt Madame Lecadre intervened to get him out of the army if he agreed to complete an art course at a university. 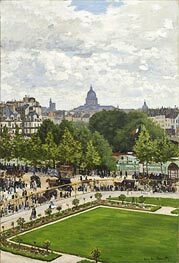 Disillusioned with the traditional art taught at universities, instead in 1862 he joined the studio of Charles Gleyre in Paris, where he met Pierre- Auguste Renoir, Frederic Bazille, and Alfred Sisley. 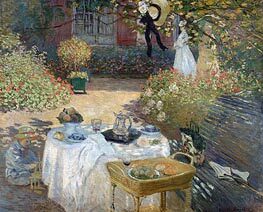 Together they shared new approaches to art, which later came to be known as impressionism, featuring open spaces and light painted with thick brushstrokes. 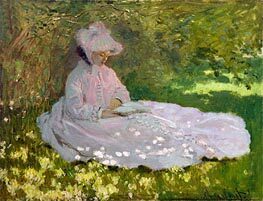 Monet's 1866 The Woman in the Green Dress (Camille, ou la femme à la robe verte), which brought him recognition, depicted Camille Doncieux. Shortly thereafter Doncieux became pregnant and bore their first child, Jean. 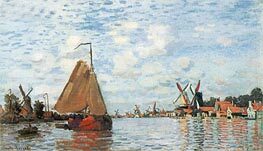 During the Franco-Prussian War (1870–1871), Monet took refuge in England to avoid the conflict. 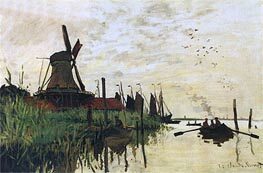 There he studied the works of John Constable and J. M. W. Turner. 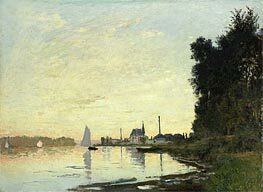 Upon returning to France, in 1872 (or 1873) he painted Impression, Sunrise (Impression, soleil levant) depicting a Le Havre landscape. 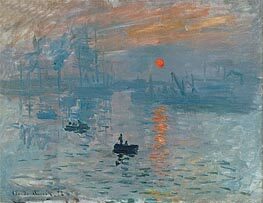 It hung in the first impressionist exhibition in 1874 and is now displayed in the Musée Marmottan-Monet, Paris. 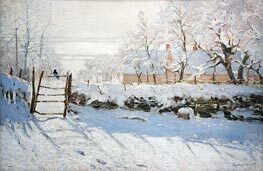 From the painting's title, art critic Louis Leroy coined the term "impressionism". 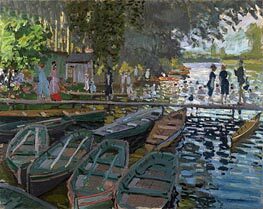 Alice Hoschedé decided to help Monet by bringing up his two children together with her own. 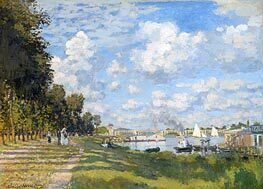 They lived in Poissy, which Monet hated. 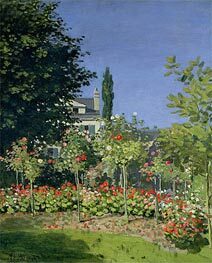 In April 1883 they moved to a house in Giverny, Eure, in Haute-Normandie, where he planted a large garden which he painted for the rest of his life. 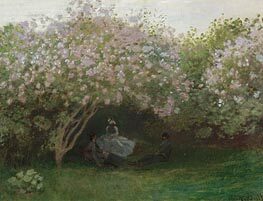 Monet and Hoschedé married in 1892. 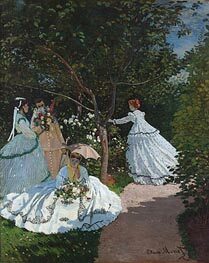 In the 1880s and 1890s, Monet began "series" painting - paintings of one subject in varying light and viewpoints. His first series is of Rouen Cathedral from different points of view and at different times of the day. Twenty views of the cathedral were exhibited at the Durand-Ruel gallery in 1895. 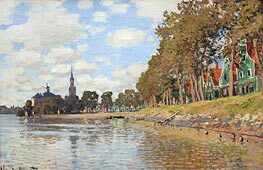 He also made a series of paintings of haystacks. Water Lily Pond (Le bassin aux Nympheas) 1899 Monet was exceptionally fond of painting controlled nature - his own garden, his water lilies, his pond, and his bridge. 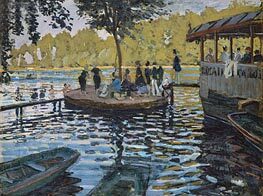 He also painted up and down the banks of the Seine. 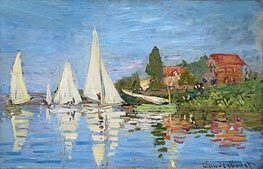 Between 1883 and 1908, Monet travelled to the Mediterranean and painted many beautiful landscapes and seascapes such as Bordighera. 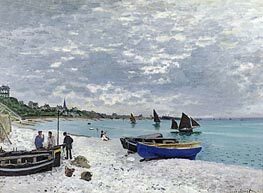 Landmarks were another subject for Monet in the Mediterranean. His wife Alice died in 1911 and his son Jean died in 1914. Cataracts formed on his eyes for which he underwent two surgeries in 1923. He died December 5, 1926 and is buried in the Giverny church cemetery. 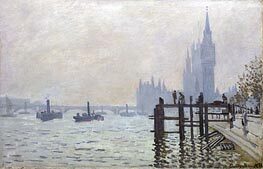 In 2004, London, the Parliament, Effects of Sun in the Fog (Le Parlement, Effet de Brouillard) (1904), sold for over U.S. $20 million.